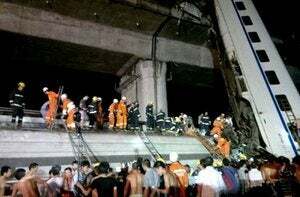 Two bullet trains have collided over a bridge in Wenzhou, China. As a result, four carriages of the first train derailed. Two were catapulted by the force of the impact into the ground, killing at least 16 passengers. Authorities fear that more victims could be found, since each carriage carries at least one hundred people. So far, 89 people have been treated for injuries in local hospitals. Three of them are in critical condition. It's the first accident in the history of China's much trumpeted high speed train network. China is investing heavily in bullet trains but recently there has been slow down in the expansion after reports found the lines to be not safe enough.